Arena, D., and D. L. Schwartz. (2010). Stats Invaders! Learning about Sta- tistics by Playing a Classic Video Game. In Proceedings of the Fifth Inter- national Conference on Foundations of Digital Games, ed. I. Horswill and Y. Pisan, 248-249. New York: ACM. Bransford, J. D., Brown, A. L & Cocking, R. R. (Eds.) (1999). How People Learn: Brain, Mind, Experience, and School. Washington, D.C: National Academy Press(= 森敏昭・秋田喜代美監訳 (2002) 「授業を変える」 北大路書房 ). Bransford, J. D., and D. L. Schwartz. (1999). "Rethinking Transfer: A Simple Proposal with Multiple Implications." Review of Research in Edu- cation 24:61-100. 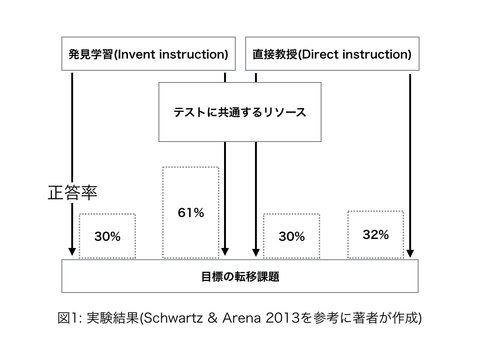 Schwartz, D. L., and Arena, D. (2013) Measuring What Matters Most: Choice-Based Assessments for the Digital Age.. The MIT Press. Schwartz, D. L., and T. Martin. 2004. "Inventing to Prepare for Learn- ing: The Hidden Efficiency of Original Student Production in Statistics Instruction." Cognition and Instruction 22:129-184. 大浦容子（1996）熟達化. 波多野誼余夫（編）認知心理学5 学習と発達, 東京大学出版会, pp.11-36.